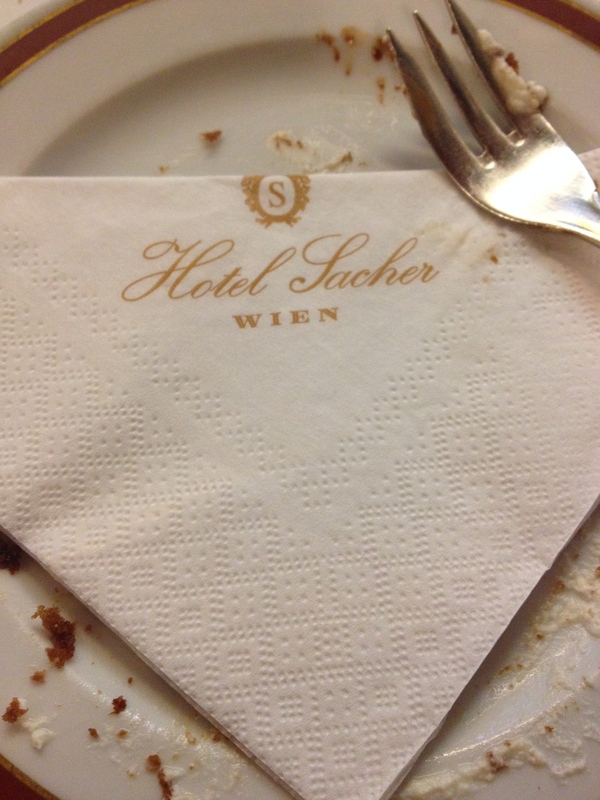 No doubt the Sacher Hotel is one grand old hotel. With a storied past and a famous cake that people come from all over the world to indulge in. 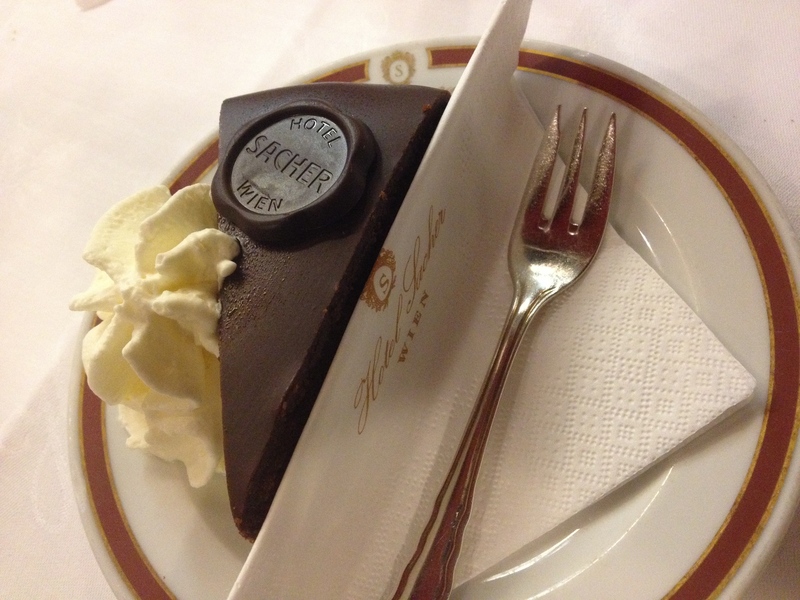 The Sacher hotel and their namesake cake have become an institution. I was a little bit self-conscious doing something so touristy. 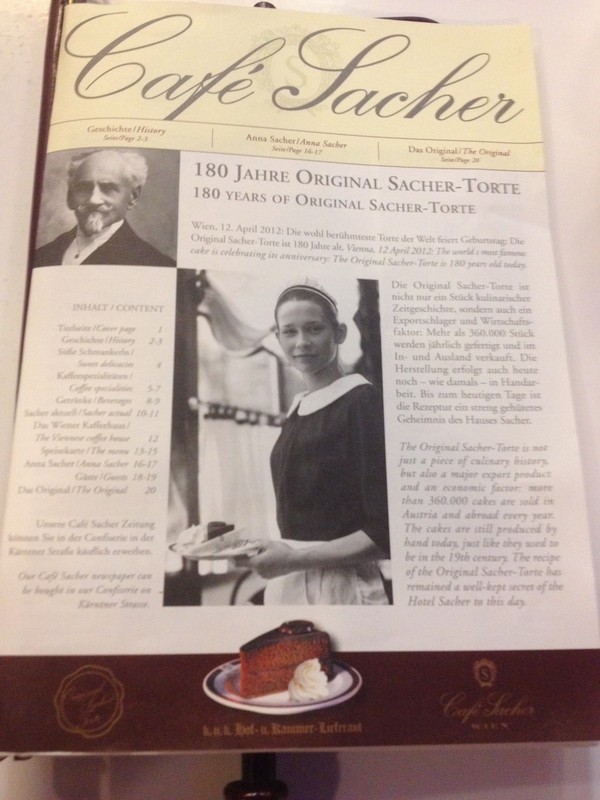 In truth I was half expecting a bus tour to pull up any moment whose theme was: the original Sacher Torte experience! Thankfully, that didn’t happen. The staff at the Sacher kept everything very classy, not showing any disdain or approaching any table and saying: Let me guess, you want 4 Sacher Tortes, right? As I waited to be seated I contemplated the very old world, kind of prissy, cafe. Which is nonetheless a perfect, period, piece much as it was when it opened. Classy and classic, yet all those oil paintings and chandeliers are really not my thing, so I asked if I could sit outside and enjoy the terrace and the first cool night since arriving. 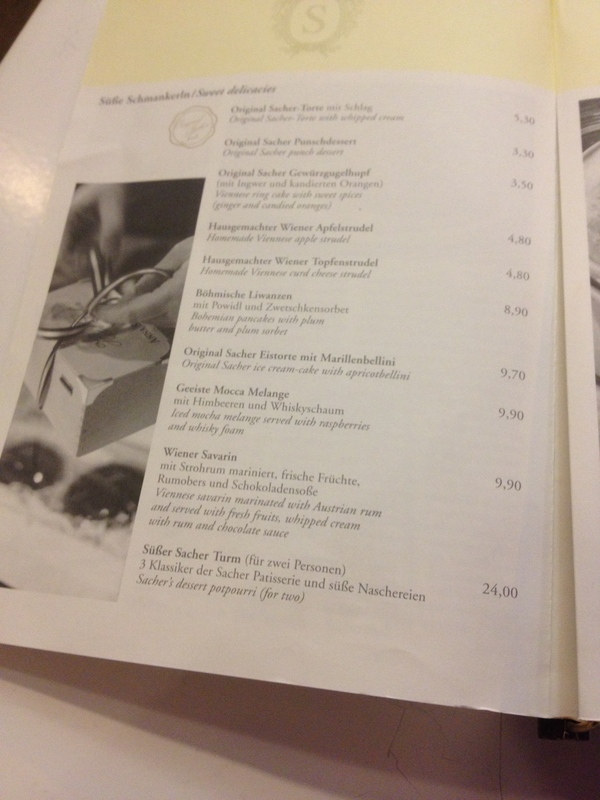 The menu is actually in the format of a mini newspaper which is for sale in the gift shop. It also contains the food , drink and most importantly the dessert menu. They sell over 360,000 cakes a year for both domestic and international consumption. They come in a variety of sizes and come in their very own wooden box. The prices range from $27.65-$58.68 a slice in the cafe is very reasonable $7.15. Before we get to dessert tho lets start with dinner. Just to prove all tourists just want to eat cake, I actually ordered dinner. 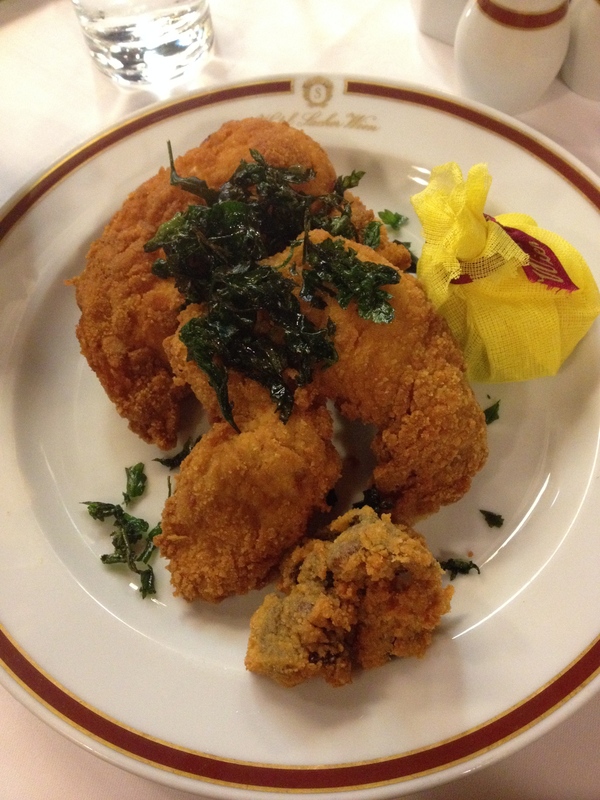 Of course in German, on the menu, it looked very exotic, but when the waiter looked at me and said: OK so you will have the fried Chicken. Anything to drink with that? To my credit I did not ask for decaf coffee like the table next to me. The table next to me which turned over twice during my dinner, and yes everyone ordered Sacher Torte. Not that I say that with any withering criticism – I ordered it – it’s just, well it’s a cafe with a full menu and if there are 4 of your why not try something else? I was just me so it’s not like I could order three desserts. And a Viennese coffee and dinner. Speaking of dinner, it was presented with great style. The chicken was well cooked and the leg still had the bone in. Differentiating it from Schnitzel I suppose, nonetheless it did taste very much like one. Garnished with fried parsley, because you know, fried food taste better 😉 The side dish was most strange to my New York palette and took me by surprise. 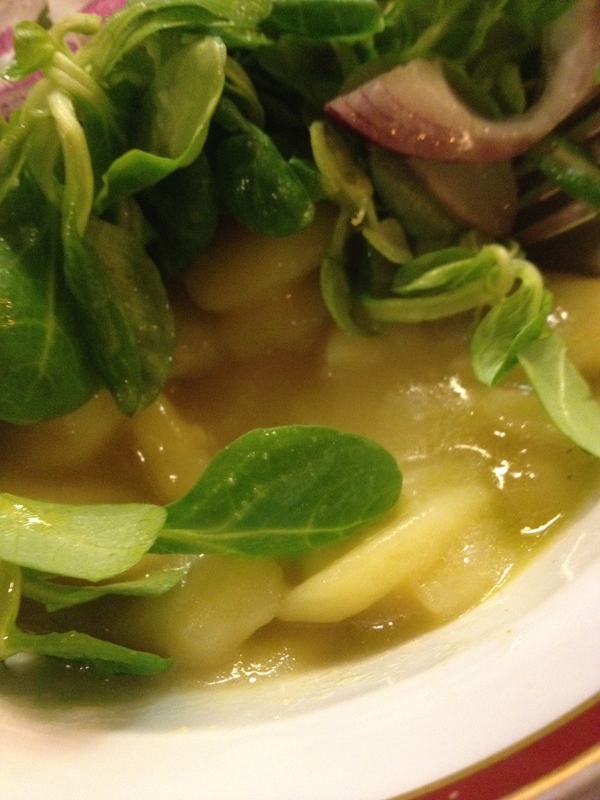 A lovely salad a top running potatoes. I’d had something similar in Berlin, but somehow had forgotten about them until last night. 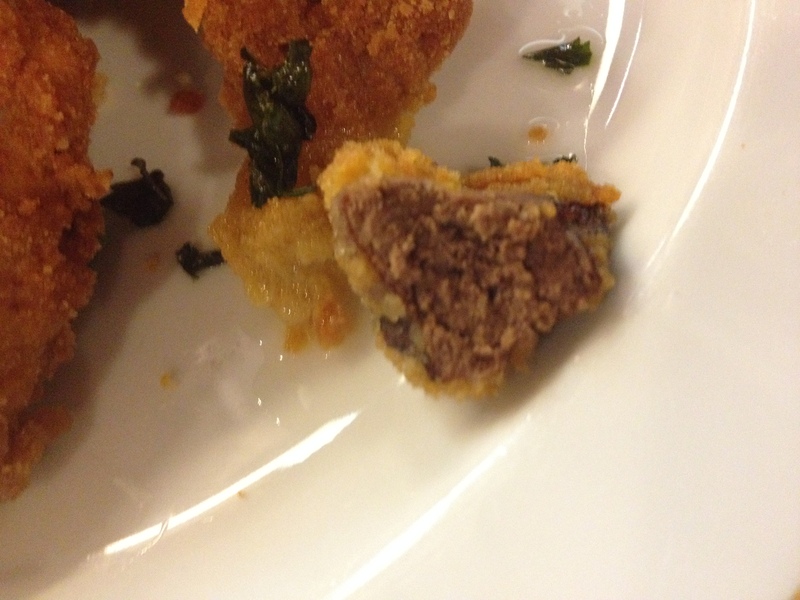 Oh and the chicken was served with its liver a fried and breaded. 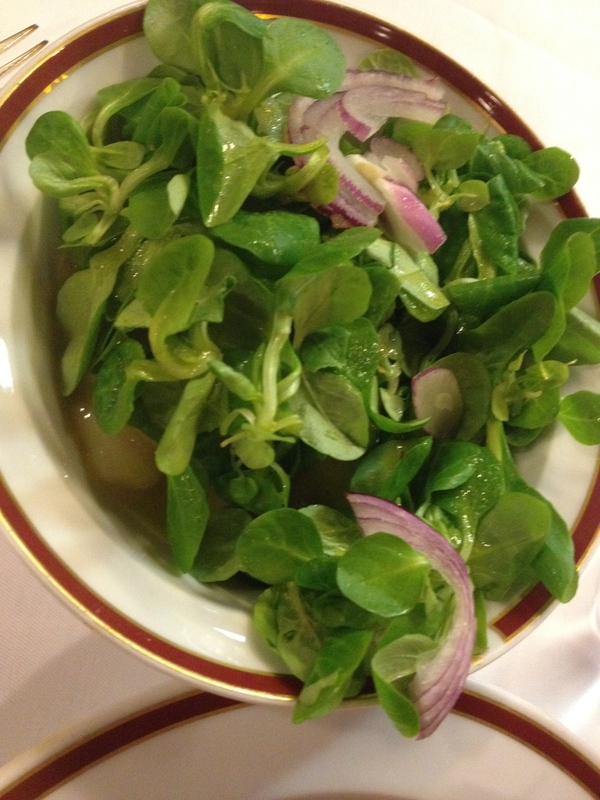 In addition I had 2 glasses of lovely Gruner Veltliner which were reasonably priced at $6 a glass. So what about the Torte. When the waitress finished clearing my table she asked if I wanted any dessert. Being the sly, not totally clichéd and absolutely self-conscious tourist I am, I said: I’ll have the chocolate cake. The presentation as you can see was classic. The cake itself is so hyped and I have had other versions, so what I think is that it’s very sweet. The cake itself doesn’t have so much flavor and has a distinct crumb to it that is just shy of being dry. Apricot jam is often between the layers and on top along with a think over the top chocolate ganache which both fills and covers the cake. A single dark chocolate medallion and a dab of mit shlag which unfortunately looks like it was from a can of Ready Whip is the only adornment. My qualms with it have nothing to do with the quality or craftsmanship which goes into mass producing, I mean making this fine product. It’s just not my favorite dessert. Was I glad that I went: Hell yeah! Did I have a good time: Indeed. The only thing I would do differently next time is come with someone, as company would have been the only thing that would have made this experience even more special. 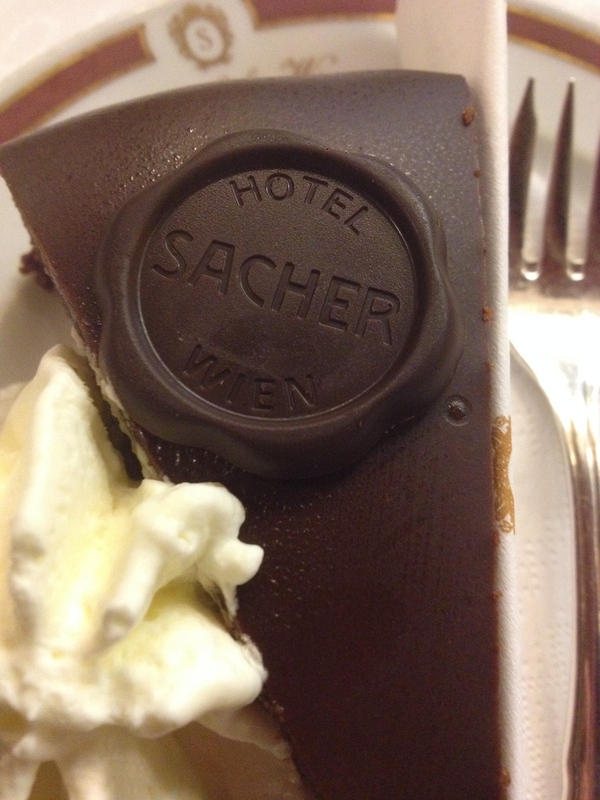 This entry was posted in Travel and tagged Sacher Torte, Vienna, Wien Sacher Hotel. Bookmark the permalink. What is in the little yellow packet beside the chicken? It’s a lemon wedge wrapped in yellow cheesecloth to catch the pits – it’s also necessary to cut the oily-ness of the fried chicken!